►Some exterior lights flash, all the doors and tailgate lock, and the security system sets. ►A beeper sounds and verifies the security system is set. ►Some exterior lights flash twice, and the driver’s door unlocks. ►The remaining doors and tailgate unlock. If the interior light switch is in the door activated position, the interior light comes on when you press the unlock button. No doors opened: The light fades out after 30 seconds. Doors relocked with the remote: The light goes off immediately. 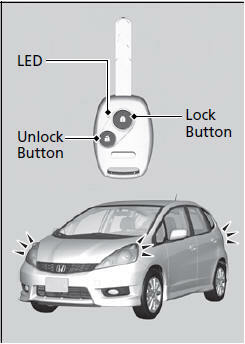 The remote will not lock the vehicle when a door or tailgate is open. When you lock the driver’s door with a key, all of the other doors and tailgate lock at the same time. When unlocking, the driver’s door unlocks first. 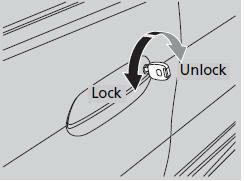 Turn the key a second time within a few seconds to unlock the remaining doors and the tailgate. 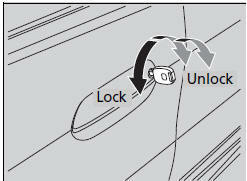 Pull and hold the outside door handle, then pull the lock tab rearward 1. Release the handle, then close the door. 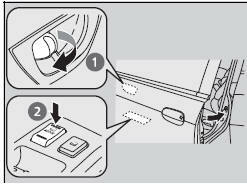 The doors and the tailgate cannot be locked when the key is in the ignition switch, and any door or the tailgate is open. When you lock the driver’s door, all the other doors and tailgate lock at the same time.